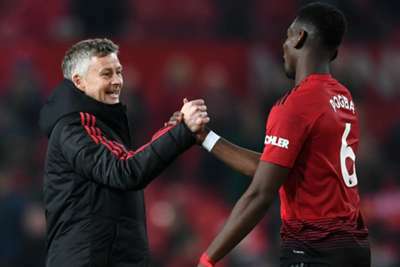 Paul Pogba wants Ole Gunnar Solskjaer to get the Manchester United manager's job on a full-time basis after restoring happiness to the squad. Solskjaer led United on a run of 14 wins from 17 games in all competitions after taking over from Jose Mourinho in December. Although back-to-back losses to Arsenal and Wolves in the Premier League and FA Cup respectively have blighted United's season, they are only two points outside the top four and will meet Barcelona in the quarter-finals of the Champions League. And Pogba, who has been in spectacular form under Solskjaer after clashing with former boss Mourinho, is keen for the caretaker manager to be rewarded with a permanent contract. "Of course we want him to stay," Pogba told Sky Sports. "The results have been great. I have a great relationship with him, he has a great relationship with the players. "He is a really happy coach that gave confidence back to the players. "This gave us the freedom to play and enjoy football again because maybe we lost that with the results that we had before." Pogba reportedly fell out with Mourinho in the early part of the season and lost his place in the starting line-up after being stripped of the vice-captaincy. The France star agrees there was a problem with confidence before Solskjaer arrived, but he wants the focus to be on the future. "Maybe we lost confidence, maybe things went wrong," he said. "A lot of talking outside that we weren't used to. "I don't like to talk about the past. I like to talk about the future because that's what matters. "We are better now, and the results have been brilliant. We are back in the top four."